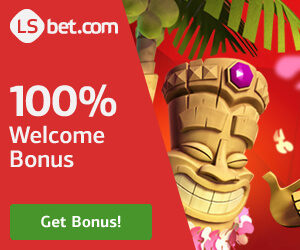 NetEntCasinoNoDepositBonus has discovered that Karjala Casino is popular. We chose to look closer on this quite new NetEnt Casino, which was founded in 2017. 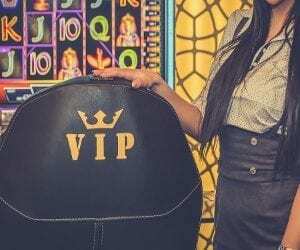 When you have opened a new account you will get asked to verify your phone-nr, when the verification process is done, you will get awarded with 10 No Deposit Freespins directly. 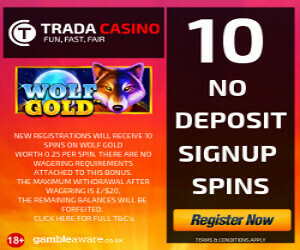 You will then get 10 No Deposit Freespins every day for the 9 following days. You will find your No Deposit Free spins in the funny game Firejoker from Play N Go. Karjala Casino is a Finnish brand. Karjala is an area in Finland. We had a chat with the friendly support, who told us that the staff drinks the Finnish beer Karjala at special occasions. Many persons from the staff come from Finland. ” They are straight ahead and honest, like Finnish people usually are”. We think that the casino is fresh and has an excellent customer support. The casino is popular because it is clear and has a nice design. The casino section is good and if you are looking for NetEnt or Yggdrasil games or a decent Live Casino you will get lots of pleasure. There is no Virtual Sports or Sportsbook otherwise it’s a casino that we recommend with 24/7 chat! They have no VIP program yet, but they give their highrollers spins sometimes and bonus money. For various legal or commercial reasons, Karjala Casino do not permit accounts to be opened or used by players resident in certain jurisdictions, including the United States of America (and its dependencies, military bases and territories including but not limited to American Samoa, Guam, Marshall Islands, Northern Mariana Islands, Puerto Rico, and U.S. Virgin Islands), Afghanistan, Algeria, Angola, Anguilla, Antigua & Barbuda, Argentina, Aruba, Australia, Armenia, Azerbaijan, Bahamas, Barbados, Belgium, Belize, Benin, Bermuda, Bhutan, Bonaire (Sint Eustatius and Saba), Botswana, Bouvet Island, Brazil, British Indian Ocean Territory, Bulgaria, Burkina Faso, Burundi, Cambodia, Cameroon, Cape Verde, Cayman Islands, Central African Republic, Chad, China, Christmas Island, Cocos (Keeling) Islands, Comoros, Congo (Democratic Republic of), Cook Islands, Costa Rica, Cote d’Ivoire, Cuba, Curacao, Cyprus, Czech Republic, Denmark, Djibouti, Dominica, Dominican Republic, Ecuador, Egypt, El Salvador, Equatorial Guinea, Eritrea, Estonia, Ethiopia, Fiji, France, French Guiana, French Polynesia, French Southern Territories, Gabon, Gambia, Germany, Ghana, Greece, Greenland, Grenada, Greece, Guadeloupe, Guatemala, Guinea, Guinea-Bissau, Guyana, Haiti, Heard Island, Holy See (Vatican City State), Honduras, Hong Kong, Hungary, India, Indonesia, Iran (Islamic Republic of), Iraq, Ireland (sports betting prohibited), Israel, Italy, Jamaica, Jordan, Kazakhstan, Democratic People’s Republic of Korea, Kuwait, Kyrgyzstan, Lao People’s Democratic Republic, Lesotho, Liberia, Libya, Madagascar, Malawi, Malaysia, Maldives, Mali, Martinique, Mauritania, Mauritius, Mayotte, Micronesia, Montenegro, Montserrat, Morocco, Mozambique, Myanmar, Namibia, Nauru, Nepal, New Caledonia, Nicaragua, Niger, Nigeria, Niue, Norfolk Island, Oman, Pakistan, Palau, State of Palestine, Panama, Papua New Guinea, Philippines, Pitcairn, Poland, Portugal, Réunion, Romania, Rwanda, Saint Barthélemy, Saint Helena (Ascension and Tristan da Cunha), Saint Kitts & Nevis, Saint Lucia, Saint Martin (French part), Saint Pierre and Miquelon, Saint Vincent and the Grenadines, Samoa, Sao Tome and Principe, Senegal, Seychelles, Sierra Leone, Singapore, Sint Maarten, Slovakia, Slovenia, Solomon Islands, Somalia, South Africa, South Georgia, and the South Sandwich Islands, South Sudan, Spain, Sudan, Suriname, Svalbard and Jan Mayen, Swaziland, Sweden, Syria, Tajikistan, Tanzania (United Republic of), The Faroe Islands, Timor-Leste, Togo, Tokelau, Tonga, Trinidad and Tobago, Tunisia, Turkey, Turkmenistan, Turks and Caicos, Tuvalu, Uganda, United States Minor Outlying Islands, Uruguay, Uzbekistan, Vanuatu, Virgin Islands (British), Wallis and Futuna, Western Sahara, Yemen, Zambia, Zimbabwe or other restricted jurisdictions (“Restricted Jurisdiction”) as communicated by Karjala Casino from time to time. 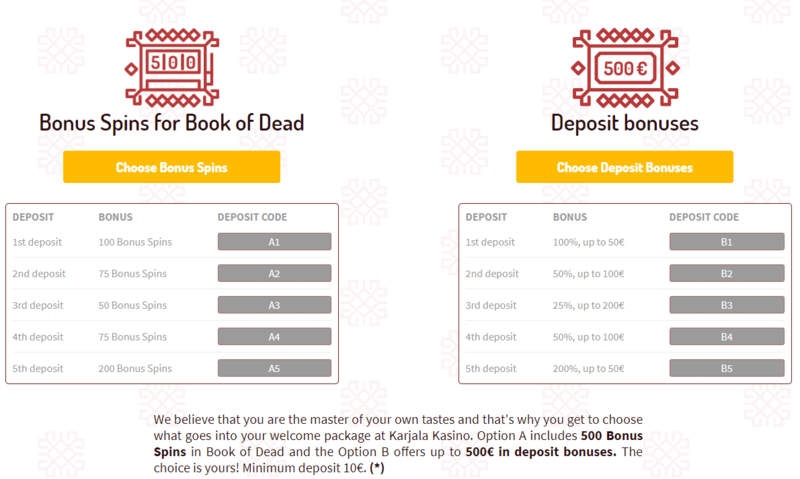 Great news: Karjala is offering 100 rounds – no deposit! 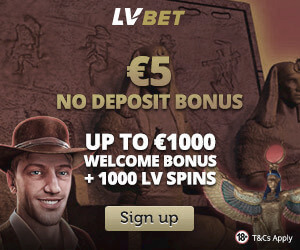 It doesn’t end there, you can also choose either 500 euro bonus money or 500 rounds on your deposit. Get a bonus for your first five deposits and you decide what kind of welcome pack is best for you. Luxembourg, Malta, Netherlands, New Zealand, Norway and Switzerland. No Deposit Bonus Terms: Offer triggered with SMS code to verify phone number. Spins valid 24h. Wagering 50x within 24h. Max win 50 €.